Decorate your kitchen with potholders, dishcloths, towel toppers and hot pads you can make using our free crochet kitchen patterns. These kitchen designs are functional, versatile, stylish, and decorative. See the master list of free crochet dishcloth patterns; this list has photos of each dishcloth design. These Scrubbies Are Included in Our Collection of Free Kitchen Patterns. These Scrubbies Are Included in Our Collection of Free Kitchen Patterns. Photo © Amy Solovay. Sometimes, a dishcloth just isn't abrasive enough to get the goo off of your dishes, pots, and pans. When that's the case, a scrubbie is just what you need. Kitchen Patterns -- Crochet Potholders. Crocheted Potholders -- Photo © 2009 Amy Solovay, Licensed to About.com, Inc.
See the master list of free crochet potholder patterns; the list has photos of each potholder design. The potholders listed above can also be used as hot pads. Here are a few additional hot pad patterns and trivet patterns for you to consider. Pictured at left is a hand towel with crocheted edging. This is one possible approach to making pretty kitchen towels; you could also crochet your towel toppers and towel hangers. The following links will take you to some examples of this. Placemats add a touch of charm to your kitchen table, while at the same time protecting it from spills and scratches. Pictured here: Erica Jackofsky's country plaid placemat. You'll crochet this design in two contrasting colors of sturdy worsted weight kitchen cotton. Coasters come in handy in the kitchen and any other room in the home where people might want to set down a beverage. 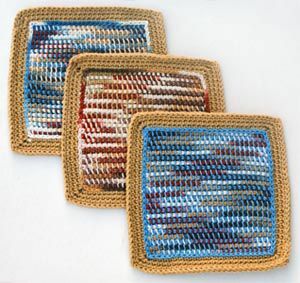 If you're interested in making durable, washable coasters, crocheting them is a great idea. 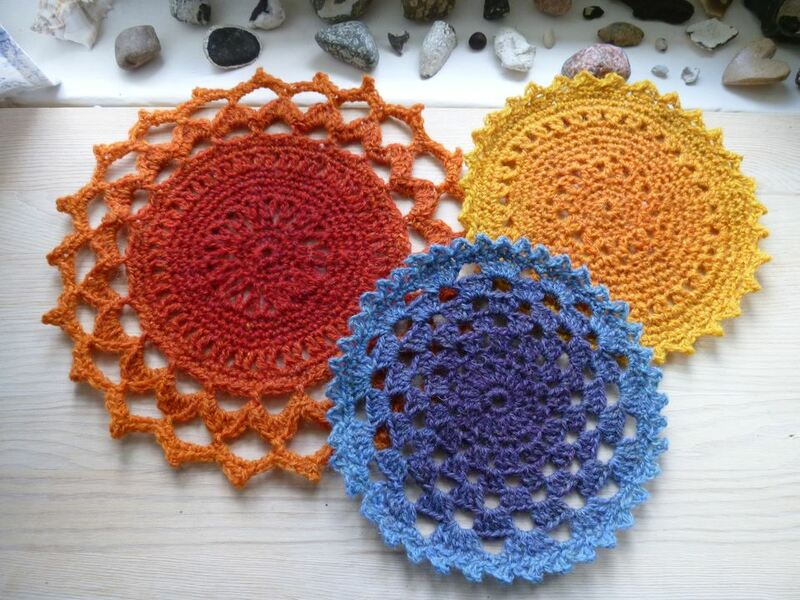 Pictured here: You can crochet these easy round coasters at the same time you practice crocheting in the round. Erica Jackofsky's free tutorial teaches you how to do it. Whether your beverage of choice is water, wine, coffee, or something else all together, we've created designs for fun cozies that'll help to insulate the beverage and enhance the drinking experience. Pictured here: Coffee drinkers will welcome this cozy addition to the French press, which also helps to protect fingers from getting burned.